This Crimini mushroom pizza recipe is a yummy way to get your vegetables in. Our homemade pizza recipe makes a great veggie pizza. These delicious recipes are simple and can be created using your favorite mushrooms. Add other favorite veggies and cheeses to make it really personal! Prepare pizza dough by placing it a pizza pan or stone. Pinch edges up like you would a pie shell. Heat 2 tablespoons olive oil in a skillet over medium-high heat. Saute mushrooms until just before they turn brown. Remove from heat and set aside. Pour 1 tablespoon olive oil in the skillet and saute the onions. Add tomatoes and chicken stock and cook for 2-3 minutes. Add salt and pepper to season. Spread tomato mixture over dough. Sprinkle mushrooms on top and then cover with cheese. Preheat oven to 350 degrees. Place pizza crust on baking sheet. In a small bowl, mix together olive oil and sesame oil. Brush onto pre-baked pizza crust, covering entire surface. Sprinkle spinach leaves and tomatoes over crust. Cover pizza with shredded mozzarella, and top with sliced mushrooms. 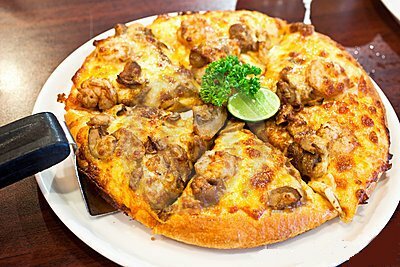 Enjoy this mushroom pizza recipe!